Early summer is strawberry fun time. Set aside a forecasted clear day to celebrate the sweet, warm days of summer ahead. You’ll harvest berries, preserve them in various ways of your choice, then finish with a delicious strawberry pie. 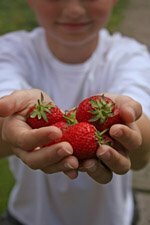 Strawberry fun starts with the harvest: Drive to a nearby U-pick strawberry farm (they are available across the country, urban to rural) and fill your baskets. Kids will experience the wonders of fruit growing from soil and sunshine. To find one near you, go to localharvest.org, call your local cooperative extension service, or look through print and Craigslist local ads. Set up a strawberry fun factory: Once back home, set up a group factory for making strawberry treats for the future, including frozen kabobs, strawberry preserves, or if children aren’t involved, the first steps of making strawberry wine. - The berry rinsing station where berries are placed in colanders under cold running water and drained. - The de-coring station where the harder white core and any remains from stems are cut from the berries. Kids love this part when the safe metal hand-tool created just for this purpose is used. Otherwise, an adult can take this station with a sharp knife. - The kabob station, where clean drained berries are pushed onto kabob sticks (you may also want to use popsicle sticks – not as sharp and pointy, safer for younger children) and inserted into individual plastic freezer bags. Making strawberry preserves & strawberry wine: These strawberry activities are more elaborate, there are various free tutorials online, or you may be interested in two affiliate downloadable books: The Ultimate Guide to Canning & Preserving and/or Delicious Wine Making Made Easy which even shows how to make wine from many ingredients from your back yard. The strawberry pie baking station: After the kabobs are made and stored, set up a pie making station according to a favorite recipe. You’ll need a station for cleaning and slicing strawberries, mixing in sugar and other filling ingredients according to your recipe, and either making the pie shell or rolling out and fitting pie pans with a pre-made shell. The finish of the strawberry fun day: After clean-up, you will have a freezer full of sweet treats the kids can grab like popsicles for the coming summer days, and/or strawberry jam to last throughout the year or strawberry wine in the process of aging. Your group will be deliciously tired and contented after a good day’s “work” which you can celebrate with just-out-of-the-oven strawberry pie topped with vanilla ice cream and fresh strawberries. (One pie can be put into the freezer to remember summer in the months ahead). This is a very quick version of the good ol’ days where we discovered harvest today brings rewards tomorrow, while the entire outing, harvesting and celebration can take place during one sunny Saturday.